A system able to resolve important problems, such as the need to have highly complex medical cases examined by a specialist while moving neither the patient nor their doctor, and all at very low cost. But this system, as Francesca Frexia head of the Healthcare Flows Programme explains, is merely the tip of the iceberg seen above the waters of research and development. 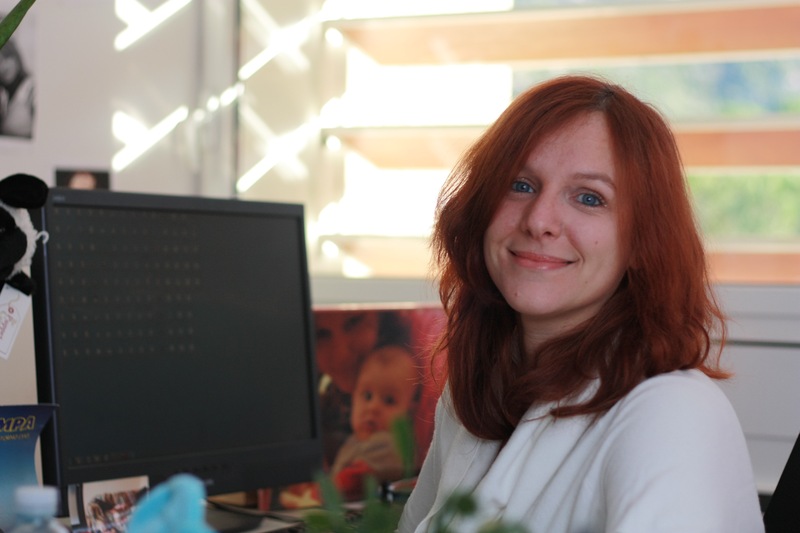 Graduate in Biomedical Engineering from the University of Genova in Italy, Francesca Frexia joined CRS4 in 2002. She started in the Image Processing and Physical Simulation group, then moved to the Biomedical Computing department and since 2014 she guides the Healthcare Flows Programme. At the moment she is working on interoperability and traceability issues within the healthcare sector, on data modelling, clinical process modelling and telemedicine. Previously she participated in research projects into medical applications of technology such as a three-year collaboration in Brotzu Hospital in Cagliari and industrial projects with Inpeco – a multinational company operating in the laboratory automation sector. Francesca, what is special about telemedicine? The truth is… I don’t really know! Let me try to explain with an example: at CRS4, my colleagues and I on the Healthcare Flows Programme deal with research and development specifically in the use of technology and IT in medicine, biology and clinical practice. We look at problems of interoperability, traceability and biomedical data modelling. They are complex issues of crucial relevance to improve patient care, safety, efficiency and also sustainability. Telemedicine is like the tip of an iceberg, just a tiny part of what we do, anyway I could talk for hours about other activities, barely mentioning our telemedicine activities and all our interlocutors would be left with would be matters related to telemedicine. A colleague often compares this to online videos of kittens and their ability to grab our attention to the exclusion of everything else. Joking aside, telemedicine has opened and continues to open a huge spectrum of possibilities for the delivery of high quality, safe clinical services: in the clinical field, thanks to remote consultation systems, specialists can now be ‘accessed’ in immediately, whilst not actually physically present, and second opinions can be sought in cases where there are uncertainties. This is even more crucial for patients in isolated locations that are difficult to reach, or where numbers of specialists are few and far between, because it allows the widest possible access to specialist medical support and more equal service provision. Another extremely important application of telemedicine, and one that will become even more so, is its application in social work cases helping chronically ill, disabled and frail people – and their families. is its social application in helping chronically ill, disabled and frail people – and their families. The development of platforms that allow constant patient monitoring, in a non-invasive way, even in the patients’ own homes, has enormous potential both from the quality of life perspective and from that of treatment sustainability. So, trying to keep my answer to your question as concise as possible, aside from the clear practical advantages, even if often still potential rather than actual, I believe what makes telemedicine special is how fast the benefits of using it become apparent, and even the hope that we are able to shrink the distance and bring patients closer to the best help available. And why isn’t telemedicine as widely used as, perhaps, it should be? The answer can best be summarised by a phrase I recently heard at a conference: “Health-IT is not complex because of the IT element, but because of the health element”, in the sense that technology could potentially do a lot more than we currently see in the healthcare sector, because many solutions are mature and could be adopted, but to really ‘move’ it into everyday clinical practice a number of additional factors need to be present – around organisation, training, legal requirements and ethics – and these cannot be neglected. I believe this is generally true whenever you look to develop any new process, for example in public administration or business, but it is very much more crucial when you are dealing with a delicate sector such as health. Here, injecting technology may not bring the results you expect if you fail to take into consideration the individual context of its application. And then there’s the opposite risk, being too ‘timid’, allowing oneself to be stymied by red tape, or slowed down by digitalising parts of convoluted and complex processes in a bid to reduce the number of objections you might face. It’s a subtle and delicate balance, and it is very easy to make a mistake or fail: a multidisciplinary approach is indispensable because there are many different factors that bring to bear, and the human factor, in primis. Most national and international telemedicine projects fail to pass the prototype or pilot stage, never making it to ‘production’ because they are either destined for too niche a context or because they have failed to anticipate how to deal with problems likely to arise later on in the process. There’s no magic formula for success, but a good starting point for resolving problems is to submit them, right from the outset of the project, to a detailed analysis in terms of the actual processes involved and of how they should and could develop. And to take a good look round, both so as to not reinvent the wheel, as well as to learn from others’ successes and mistakes, which are often also more illuminating. For guidance on which road to take when passing from prototypes to clinical practice, several telemedicine evaluation projects have been started. These include RENWING HEALTH: its key aspects identified so far include experimental effectiveness, economical sustainability and organisational sustainability. From the first trial at the Brotzu Hospital in Cagliari with the REMOTE project you went on to develop MOST and CONNECT. The only thing missing from this story of trials and innovation seems to be the happy ending, when it actually becomes a commercial product. So, is this likely to happen? Under what conditions? The telemedicine system that we have developed during these years of research allows audio-video transmissions in real time, using standard technologies and at low cost. It started with the REMOTE project in the Paediatric Cardiology context, through our collaboration on the ground with Doctor Tumbarello and his department at the Brotzu Hospital. It’s the only specialist centre for congenital heart disease in Sardinia.And FAST, or Focused Assessment with Sonography for Trauma, was first used at the IRCCS Burlo Garofolo in Trieste also in a clinical setting, this time in emergency medicine. And it worked really well. The trials were with around a hundred patients who were examined with and without the system, and on a ‘double’ or ‘triple’ basis (the patient was examined two or three times by different clinicians). The trial showed almost 100% agreement between the ‘live’ encounters and ‘distance’ encounters. But what is still lacking before the system can be introduced into clinical practice is certification of the system and its transformation into a real live product, a step beyond the remit and institutional role of CRS4. In an attempt to shorten the time between research and marketplace, in the context of the MOST project we re-engineered the system, making the architecture more general and modular, in direct collaboration with a cluster of 10 businesses in Sardinia. At the conclusion of the project the whole framework was made available in open-source format. Currently, in the telemedicine field we are focusing on pursuing REMOTE research activities, and with the CONNECT project studying new mechanisms of interaction between physically-disparate clinicians, but we are interested in participating in projects geared towards the introduction of the system into everyday clinical practice. This is because we believe in the added value it could bring to improving treatment quality, training and sustainability of medical services. Why is it important to emphasise that it is all about real-time consultation? Because real time is a crucial feature. Telemedicine systems based on store-and-forward mechanisms, or rather those that gather and send unsynchronised images, are less complex to develop because they have less exacting technological requiremements. However, for some disciplines termed operator-dependent, it is essential that whoever carries out the examination is a specialist, as an examination carried out by a non-specialist could lead to inaccurate diagnosis. In paediatric cardiology, for example, an expert cardiologist lacking specific training in congenital cardiac pathologies may fail to pick up fundamental aspects of a case. For this reason it is important to concentrate on real time transmissions, especially for those pathologies for which national expertise is limited to just a few professionals. One feature of your system is the use of low-cost equipment and with open standards. In what sense? In the sense that real-time telemedicine systems are generally expensive, proprietary, closed and requiring dedicated web infrastructures. While what we have tried to do is completely change the paradigm, offering practical solutions with hardware that is widely available on the open market at low cost, usually termed COTS – commercial-off-the-shelf. Our solutions, requiring limited investment, provide a fully-functional system with diagnostic-quality images. Moreover we have adopted a philosophy – that characterises a good proportion of our business activities – of open standards and of open-source sharing of results, to aid in the re-use of the system in contexts that both may be different but exhibit similar problems. Working in the health sector it is impossible to avoid ethical challenges. What protocols have you followed in this regard? Every trial we have undertaken has firstly been discussed and clarified with the relevant ethical authorities of the health structures within which we intend to carry out our research. However, even knowing that the trial will have no negative effect on patients, and even having followed the most rigorous and correct procedures, when a child was impatient while an examination is repeated, anxiety in the team has always shot up! But each time this has happened, our worries have been abated by the parents of the little patients, who have gently invited their child to bear it in order to help other little children like them to avoid travelling long distances to have their medical examination. Overall, the work done to make the trials clear and comprehensible, with the informed consent of, and interviews with, the children’s parents, has always proved to be an invaluable investment, even for ourselves! Aside from the ethical factors, such psychological aspects are key. During a trial you will often come into contact with patients going through difficult situations, facing uncertainty and pain. We have learned a lot about this from psychologist Doctor Sabrina Montis, who with great far-sightedness was appointed by Doctor Tumbarello to work alongside the doctors on his ward. Patients and their relatives are often in a very sensitive state and one needs to tip-toe around them, avoiding giving ambiguous messages which given their difficult circumstances only risk adding to their worries. What kind of legal issues does this kind of system give rise to? A while ago when I was on a privacy course, I was struck by the idea that you cannot share responsibility, but rather it multiplies and I believe that in the case of telemedicine, too, it is particularly true. When a mistake occurs, who is to blame? The doctor treating the patient? The specialist working at a distance? The system? Telemedicine is essentially a means of delivery of a medical service and it carries with it all the legal implications of consultancy, with the addition of further considerations linked to data transmission. As far as the system is concerned, safety measures must be adopted to protect the transmission of data and images, ensuring privacy and maintaining the quality of the transmission, such that the information can be used effectively in studying the patient’s case. So, before putting into use this type of system, the processes need to be clearly defined, as do the responsibility profiles, the roles of the various players involved, and the risks - together with their respective mitigations. Do any guidelines exist for this type of technology? At the European level telemedicine is seen as a sort of cultural revolution developing within a framework of the general evolution of political structures and health systems. Within the digital European agenda, as part of the Europe Programme 2020, in order to bring about wider diffusion of telemedicine a key change is needed. This is reflected both in national and regional digital agendas. Specifically, for Italy the main reference point is the Guidelines put forward by the Health Committee and approved by the State-Regions Conference at the start of 2014, which list a series of elements necessary for planning telemedicine services for the national health service and the European context as a whole. The document covers strategic aspects; categorises services to be provided and the processes involved; outlines an organisational model; sets performance indicators; lists training and information required by telemedicine practitioners and patients; and give value-for-money measurement indices and privacy guidelines. In short, the aim of the Guidelines is to create a shared model of governance for telemedicine initiatives, harmonising instructions and models of application, to move from the trial stage to become formally operational. From the technical point of view, clearly the Guidelines remain at a high level, but as yet there is no more detailed information available. What are the key factors regarding the economic sustainability of the system? We have done a preliminary study of the potential cost/benefit of the system, in terms of saving transport costs. It was based on utilising the system for a year at a regional level, and was from the societal standpoint, taking into consideration both hospitals and patients and their families. Our starting hypothesis consisted in: the installation of seven remote consultation points all linked to the Paediatric Cardiology Department at Brotzu Hospital, in seven cities in Sardinia (one consultation point per ASL); and in evaluating the travel costs that could be avoided (patients’ car travel and hospitals ambulance/helicopter costs). Just looking at services provided over one year, we saw an overall saving of 66% on transport costs alone. This analysis is clearly limited, because as well as transport costs other more important factors need to be considered such as clinical effectiveness and various impacts on patient care, but it gives an encouraging starting point when considering organisational-economic sustainability. Just a little one, but one that’s ongoing. Many of the other activities that form part of the Healthcare Flows Programme are much more demanding from the technological point of view, compared with the telemedicine system. However, every time we see it in action we are so touched: seeing that something we have created with our hands and minds is now actually being used on the ground. 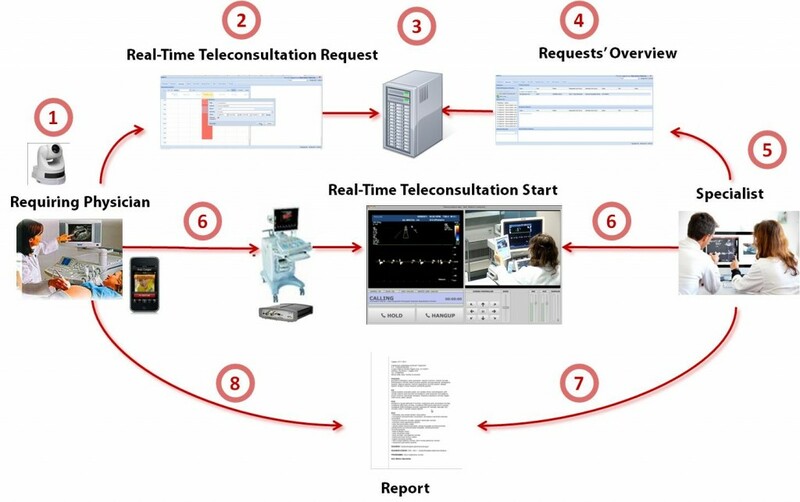 The telemedicine platform developed by CRS4 allows a specialist to guide the execution of an echographic exam performed by a medical doctor in a geographically remote center, seeing both the exam scene and the sonographic video stream while directly interacting with the operator in realtime, as shown in Figure (Figure 1).Let us now suppose that we want to add more data to our red wine database, say the ratings of these wines for the years 2007 and 2008. In the case of a relational database, a simple way to do this is to add 3 new rows to Table 1 for each of the two additional years. Alternatively, we can represent the same information using the multidimensional database shown in Figure 1.
reporting: the medical report is prepared (in a structured format, openEHR-compliant) and given to the patient after the consultation. The control station (one per each center offering specialistic support): it is a software system that can be accessed using a common laptop; through it a specialist can manage remote requests prioritization, view patient data and start teleconsultation. The base station (one per each center requiring specialistic support): based on a mixture of hardware and software, it digitizes echograph video outputs and shots of the exam scene. It also enables voice chats with the remote medical doctor. The data hub (one for the whole platform): this is a central server that stores medical records and patient data, manages voice chats, video streams, resource allocation and bookings. The interconnections between the previous components. Specialist Desktop Application: allows the specialist to view the list of patients waiting for teleconsultation, to select the desired consultation, and to perform it through an audio chat with the echographer, using remote visualization of echo and PTZ (Pan/Tilt/Zoom) camera. The specialist may control pan, tilt and zoom of the camera through the keyboard or the on-screen graphical interface. Web Application: used to schedule the availability of specialists, view the clinical records and create or edit structured consultation reports. Echographer Mobile Application: it allows the echographer to create, manage and run teleconsultations. After answering the call of the specialist, no further interaction with the mobile device is required, in order to leave the operators hands free. Web Application: it is used by the echocardiographer or other supporting personal to create and manage personal patient data, to schedule consultation, edit and view clinical records. Network A/V Encoder: this device enables remote transmission of video and audio streams generated by the Doppler ultrasound device. Through the use of network and streaming protocols that enable low latency real-time transmissions, it allows the specialist to receive in almost real-time the output of the medical device. Due to the number of sonographic device available, we adopted several different types of encoder: for older medical devices that emit analog video we chose a BNC/RCA to RTP/H264/AAC encoder (using various kind of adapters we can link any standard analog connector), while for modern devices that provide a digital video output we used a network frame grabber (VGA/DVI/HDMI compatible). PTZ Network Camera: this device provides the streaming video capture of the entire environment of teleconsultation (room, patient, sonographer) and allows the specialist to focus on the details of the examination. In addition, it can be used as a backup for the encoder by targeting the Doppler ultrasound monitor. For experimental purposes we selected a PTZ camera with night/day switch (infrared when 0.005 lux or under) that features an optical zoom (18x) and a reversible horizon (ceiling mount). Sip PBX: this component acts as IP PBX and VOIP gateway and is responsible for connecting and managing audio calls between clinicians. Application Server: this is the core of the system and it consists of four logical components responsible for user authentication, scheduling and management of teleconsultations and writing clinical records. The authentication module permits application, device and user authentication via a custom version of standard OAUTH protocol. The planning module allows to report the available time slots of specialists and secondary centers as to schedule patient visits during those time slots. The teleconsultation management module is responsible for managing the entire process for the remote visits, starting with the request of the teleconsultation, through its acceptance by the specialist, ending with the correct routing of audio streams video and voice chat. The clinical records module allows the specialist to analyze patient data and past clinical image records during the teleconsultation, thus providing valuable information to help compile the final medical report. It also allows to manage, export and print the report. Finally, it contains an administrative module for the management of care centers (i.e., register devices, sip info, etc.). VPN Tunneling: it groups all devices in a single encrypted virtual network, thus ensuring higher security for the transmitted data. Encoder Stream: it is an A/V stream carrying both the video and audio channels from the ultrasound device. The stream is transmitted directly from centers requiring and offering consultation without passing through an intermediate data center. Camera Stream: the PTZ Camera video stream, transmitted directly to center offering consultation like the encoder stream. PTZ Camera Control: an HTTP channel through which the specialist can control the camera pan/tilt/zoom features. VOIP Stream: the audio stream that allows voice communication between sonographer and specialist. It is routed, managed and distributed through the aforementioned Sip PBX. Data Stream: an HTTP stream through which all data are exchanged between the data hub components and the other systems.